This is something that will certainly turn the heads of everyone who comes into your garden. It really does make for an attractive garden feature and is so comfortable to sit and swing on that you will just love sitting on here watching the world go by. It is constructed out of natural timber and is pressure treated against rot. 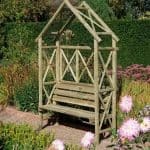 It has lattice sides, perfect for growing trailing plants and a sloping pointed roof that has a style which is very unique. The swing seat gives a gentle sway and it’s a great place to sit and reflect, while admiring the view. This product is home delivered and assembled for your convenience. The pressure treated timber which this is comprised of is very impressive and robust wood that is going to ensure you get many, many years out of this swing seat. 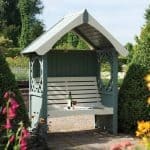 The design is very clever and it has been made so that it offers you a very solid and secure place to sit down and relax. For added stability some high quality galvanised base fittings are used which do their job incredibly well and also have an attractive look to them. If you have been looking for that fun, great looking and reasonably priced item to finish your garden off then this is it. The Barmouth Wooden Swing Seat is more than just a toy to play with in the garden. Do not get us wrong, we are sure the kids or the grandkids will have a great time with this, but this is not about seeing how high you can swing it is all about having a nice relaxing place to sit and read a book or to just watch as the world goes by. 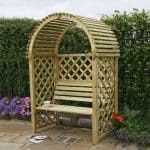 This is very well made and there is no doubting that this is something that is going to add a whole lot of charm to your garden. One thing that we really like about it is its size. At, 6 feet 3 inches wide and a little over 3 feet in its depth, it really does not take up a huge amount of space so it would look great sitting in a corner or even as the main attraction of your garden. At a little over 8 feet high it really is quite impressive when you see it for the first time and this height does make it stand out very well. We really love what they have done with the roof here. It is like a sloping apex roof and we really love the way that it looks. 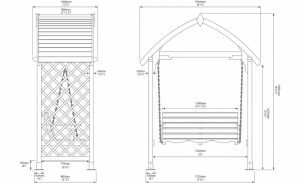 The height of this really does make the roof stand out and as it is made with some very lovely, overlap style boarding that is very thick it is going to stand up against our harsh weather very well. Well clearly there is not any cladding, but we do have something to talk about here and it is actually one of the things that we really like about this swing seat and that is the lattice sides. We really like these and honestly feel if the sides were just made out of flat wood or even some kind of cladding that this would not be half as charming as it is. These are made with natural timber like the rest of the swing seat so you can rest assured that they are very strong and long lasting. As this is designed for people to swing on a strong frame is used which you can see in the pictures it is very thick and will make this one very sturdy swing seat. The framing at the top which supports the swing is very impressive and you can see just how strong and thick it is with your first glance. Just remember that this is made for gentle and relaxing swinging so no matter how much your other half begs, do not let them give you an over under. There may be no floor here, but we do have a couple of things to talk about. To start with there is the swing. This swing looks fantastic and is made with the same kind of timber that the rest of the structure is. It is a decent size and it can actually hold two adults, just try and keep the smooching on here to a minimum you do not want the neighbours getting jealous. Another thing we want to mention here is those galvanised braces that are on the bottom these are going to provide the swing seat with some extra support so seeing these included was something we were very happy to see. As you can see this really is one very attractive looking swing seat and to keep that timber looking stylish and rot free it has undergone a pressure treatment process which will help it fight off rot and decay. While we love how the pressure treatment process has been applied we would still give it a good coating of wood treatment to give it that little bit more protection. Getting a ten year warranty is something that we always think is a great bonus and as long as you look after this right, we actually do not see you having to ever use it. Clearly there is no door on here and let’s face it if there was it would certainly make swinging on this very interesting. One thing we will say is that the area where the actual swing is, is very spacious so you will be able to sit comfortably without being close to the sides. No windows are on this, but there are lattice sides which we feel make up for it and really do give this a lot of character. No security measures are needed with the Barmouth Wooden Swing Seat so do not worry about it. We really do not see anyone climbing over your fence with a set of bolt cutters and making away with the swing. This is quite high so it is certainly going to draw quite a bit of attention so there is not really any privacy here, but honestly we do not see this as a problem and if anything, you will probably want to show this off. 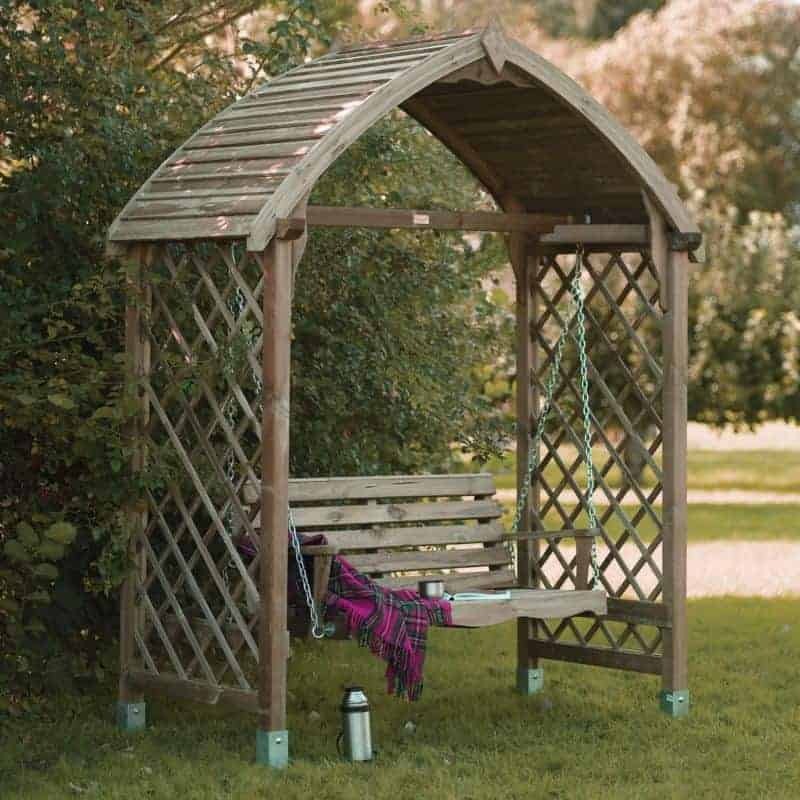 While they are not offering any customisation options with this swing seat one thing that you could do is add some flowers or climbing plants to the lattice sides, we are sure this would make it look even more amazing. Another thing you could do is give it a bit of colour, perhaps giving the sides and the roof a different colour than the swing would be interesting. There are no extras that you are offered with this, but you may want to buy some hanging flower baskets or a couple of waterproof outdoor cushions to make the swing a little bit more comfortable. An assembly service is included with this which we feel is just fantastic as it will save you having to build it yourself. This usually is something that is sold as an extra, but it is included here. You would not really think of a swing seat as something that would be high quality, but clearly a lot of time and effort went into designing this and it certainly shows in the final product. 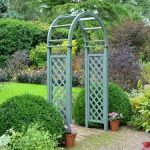 You are going to get many years of fun out of this and you will also really enjoy hanging flowers from the lattice sides. This is a very good size and it does have a very impressive look mainly due to the height of it. If you want something that is going to stand out in a positive way then this is it. This comes with an assembly service which may result in the price creeping up a little bit, but it does mean that you can relax and wait for it to be built and then you can relax some more. Over, £400 is not a small chunk of change, but we must tell you again that this is very well made and will last a long time. Final Thoughts: If you are a person who takes a lot of pride in their garden and who has been looking for that special something to just finish it off or even somewhere fun to relax for an hour or two when the weather is nice, the Barmouth Wooden Swing Seat could be just what you are looking for. 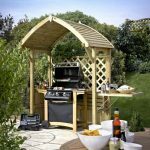 We just love the look of this, with its high sloping roof, those gorgeous lattice sides and the well made and sturdy swing. This really is that special something that will stand out in your garden. 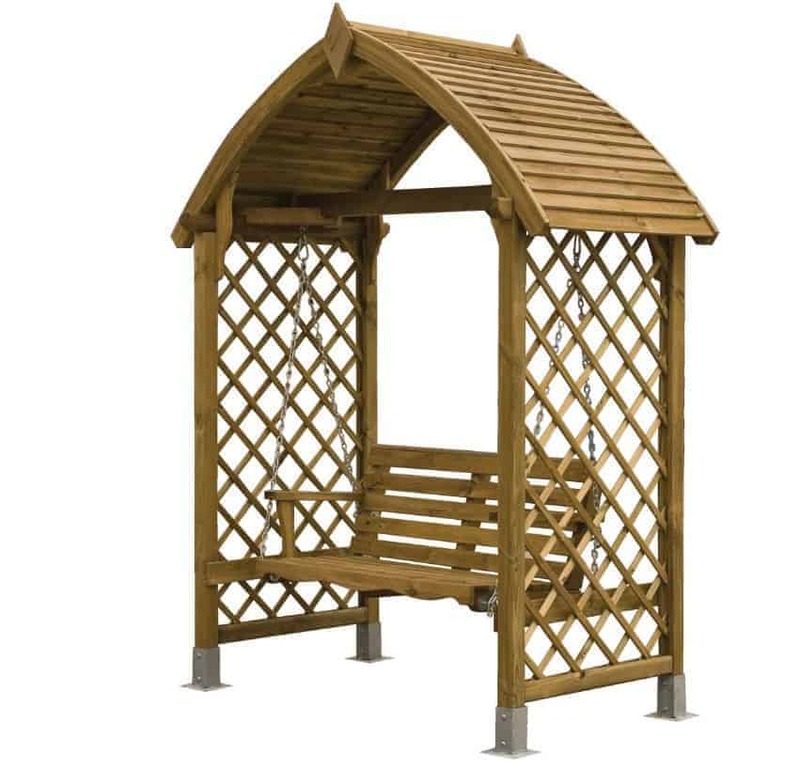 If you do want an interesting feature then this is something we highly recommend, even at this price, we feel this is something that you will be very happy with once it is standing with pride in your garden. I had hedges along my house, and I had a garden right in the backyard. When I came across this blooma barmouth wooden swing set, I knew this would pull the whole backyard together. I set it up right where I wanted it, and I was right. It looked wonderful. I loved the top of it how it came down on a curve. The swing was something different that I have ever seen. 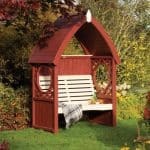 This was one arbour I would never get sick of. 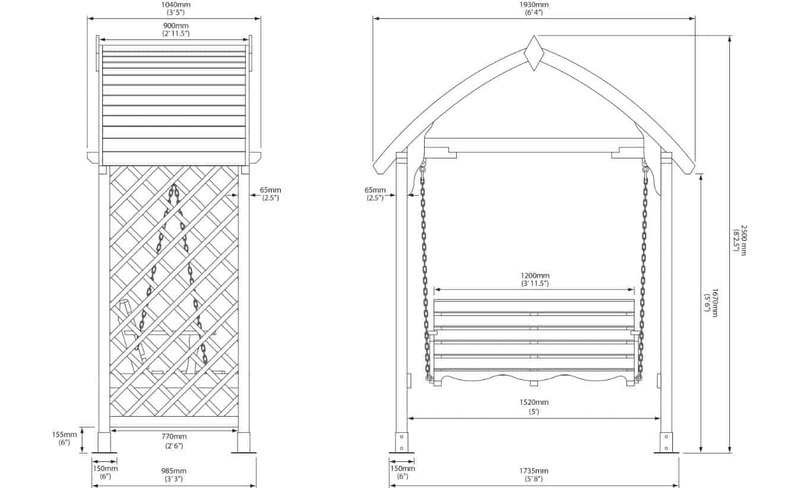 I had been looking for an arbour to put in the front of my house for years. I could never find the right one. Either they are too big, or too small. When I came across this arbour, I knew this was the right size for me. This is what I had been looking for. When I got it in person, I wasn’t disappointed. I loved how you could put flowers on the sides to make it even more beautiful. It’s nice because it is constructed out of natural timber, so you know you have quality with it.